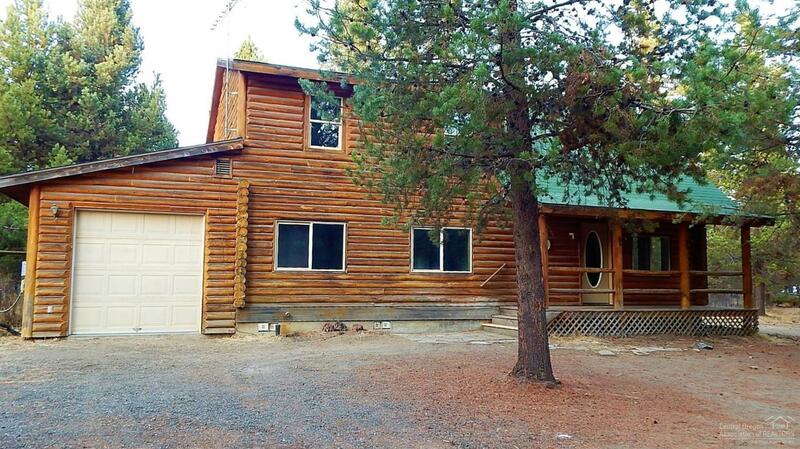 Beautiful 2 story Log home & horse property on 4.77 acres w/attached carport & detached 2 car garage. You will love the spacious living room w/cathedral ceiling, large pine beams & tongue and groove pine ceiling! Enjoy a cozy wood burning fireplace with rock accents from floor to ceiling. The kitchen has Oak cabinets, breakfast bar, dishwasher and stove. There is a dining area with a slider to the back patio.The main floor has 2 bedrooms & 1 bath, a utility room and door leading to the carport. Upstairs has a large loft and master suite with mirrored closet doors, jacuzzi type tub, separate shower & your own private balcony. Home needs TLC and is priced accordingly. The Lot is fenced with 2 gates for access. You will be close to fishing, boating, hiking, camping and all that Central Oregon has to offer! Come take a look!